Empty-nesters-to-be commission a bright, modern home that’s everything their year-round residence isn’t. Landscape architect Kristen Reimann used a fair amount of green lawn instead of meadow grasses in hopes of decreasing the family dog’s exposure to ticks. She sent architect Chuck Sullivan photos of shingle-style houses, each with a gable roof that came down over a porch, and he used them as inspiration. The exterior he designed, to his clients’ great satisfaction, features a single swooping gable over the main living space. And yes, there’s a covered porch, which gets abundant use. 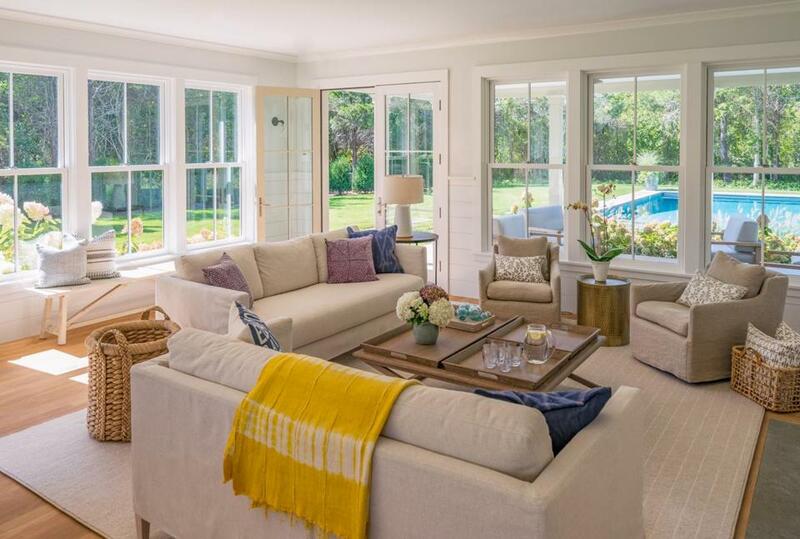 In the living room, French doors to the porch and tall windows facing the side yard maximize light and air flow. 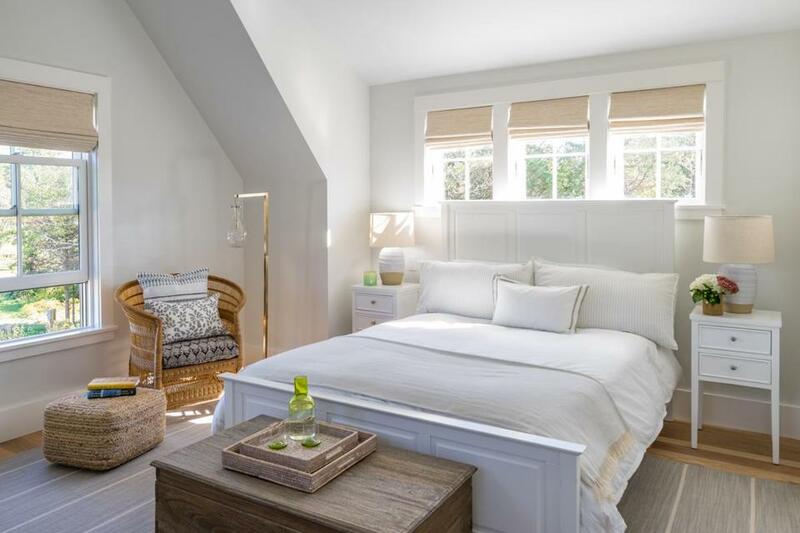 Liz Stiving-Nichols and Liane Thomas of Martha’s Vineyard Interior Design chose the furnishings and collaborated with Sullivan on interior finishes. Knotty white oak floors with a driftwood-like finish lend a beachy feel against white walls with square-edge tongue-and-groove accents. In the main living area, teak chairs with rush seats surround an elm dining table, industrial-style stools line the kitchen counter, and clear glass pendants fit in without disappearing. Sofas and easy chairs slipcovered in stonewashed linen surround a cozy fireplace. French doors open onto the covered porch, which has a blue beadboard ceiling and comfy seating. The site plan, by landscape architect Kristen Reimann, includes natural-cleft bluestone patios and a saltwater pool. She worked closely with the homeowners to position the pool, which stretches toward the back of the property, so it would neither be visible from the street nor compromise the privacy of the master suite. “Because we settled on an axial plan, with the pool projecting off the porch, we created planting beds to separate these very social areas from the private wing of the house,” says Reimann. 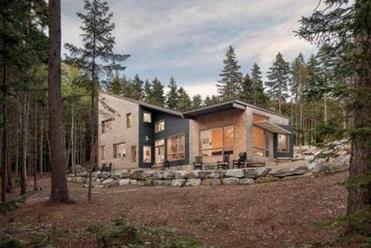 In the woods and near the water, the cheery and energy-efficient house sits on land passed down by their grandparents. Designer Liane Thomas extended the home’s neutral palette to the guest rooms on the second floor. Anne prepares lunch at the kitchen island. French doors in the office open to a path of steppingstones that lead to the pool’s lounge area. 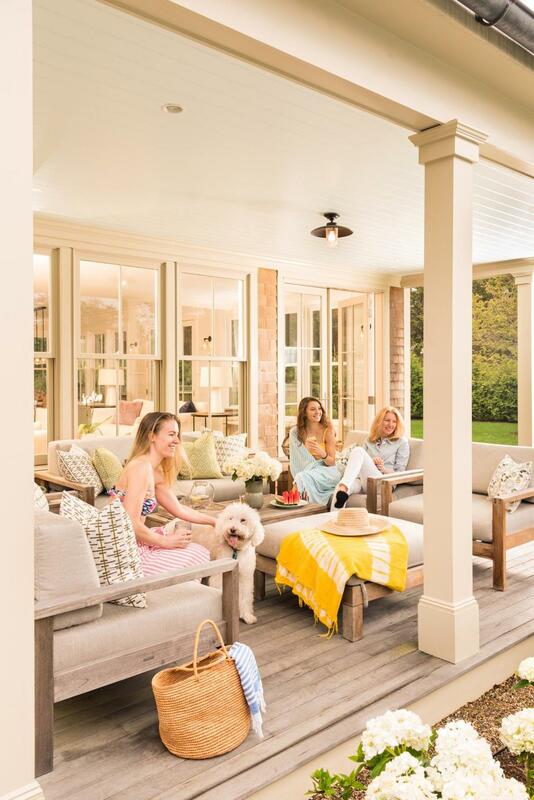 Anne and her nieces Sarah — with Lily the poodle — and Grace relax on the covered porch, which is furnished with teak pieces from Kingsley Bate. “It’s a nice extension of the living space,” Thomas says.